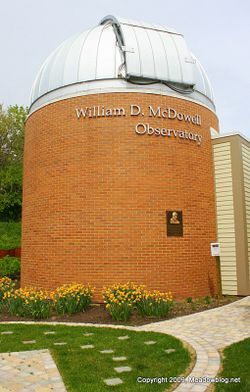 On Monday, the William D. McDowell Observatory in DeKorte Park begins a new month of free observation nights on Monday and Wednesdays at 9 p.m.
Click "Continue reading …" to view entire June observatory schedule. 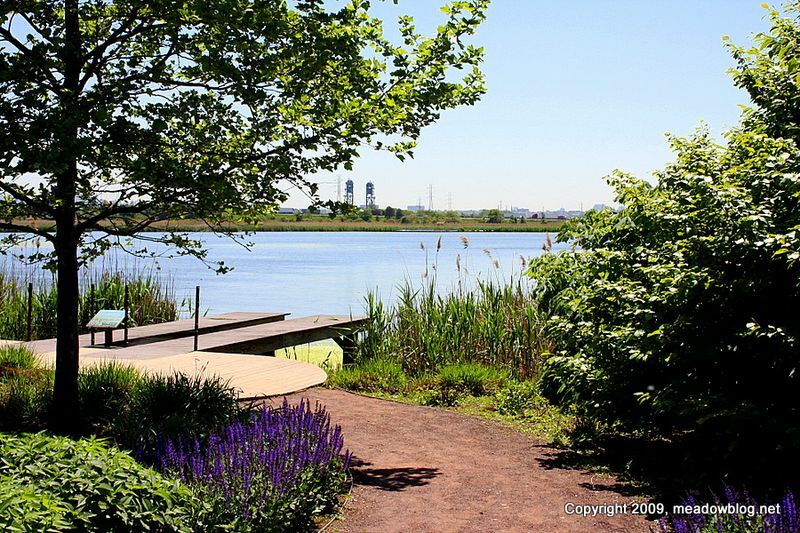 The Meadowlands Commission's Jim Wright will give a free talk, "The Meadowlands — Past, Present and Future." next Thursday at the Little Ferry Public Library. 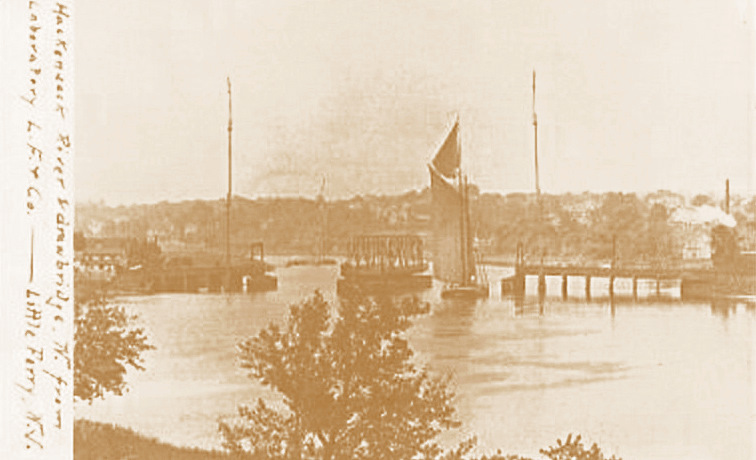 The 6:30 p.m. show will include some great archival shots of the region, as well as some amazing nature photos taken in Little Ferry. The show will run approximately one hour, including a question-and-answer session. The talk, part of the commission's year-long 40th anniversary celebration, is the last one scheduled before next fall. Click "Continue reading…" for details on the talk. 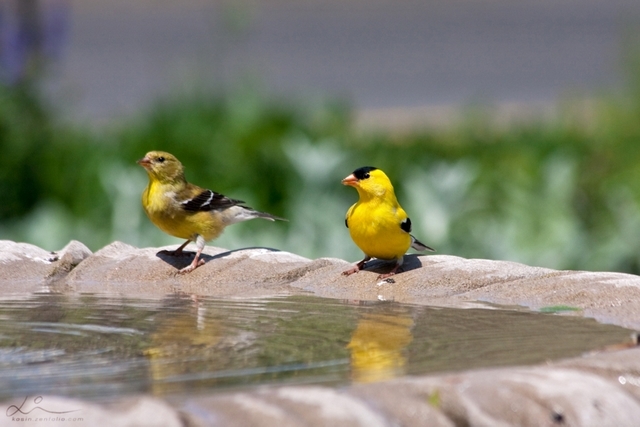 Izabela Gard got this shot of two American Goldfinches (the state bird) at the Butterfly Garden bird bath at DeKorte Park over the Memorual Day Weekend. 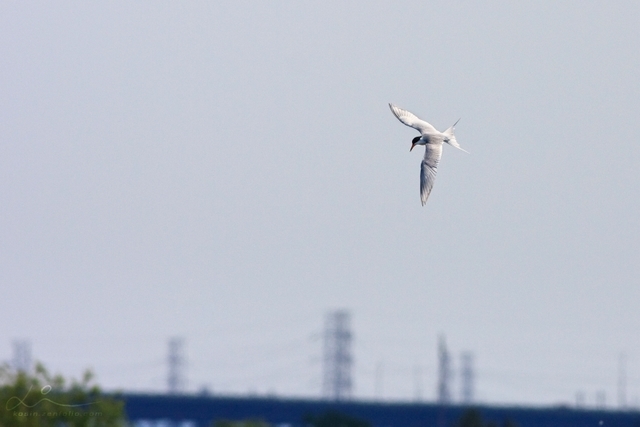 Greg Gard got the shot below — of a Forster's Tern over the nearby Kingsland Impoundment. Can Black Skimmers be far behind? On Sunday, July 19, the Meadowlands Commission and the Bergen County Audubon Society are sponsoring "Butterflies for Beginners," offered free to anyone interested in learning how to identify the butterflies of the Meadowlands. Optics for butterflies and backyard butterfly gardens will be discussed, followed by a short walk. Butterfly aficionados of all levels are welcome. The event is from 1 to 2:30 p.m. at the Jill Ann Zimkiewicz Memorial Butterfly Garden in front of the Meadowlands Environment Center in DeKorte Park, Lyndhurst. To RSVP or get more information, contact Jim Wright of the NJMC here, or call 201-460-2002. 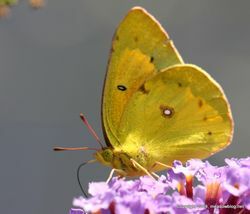 Click here to see photos of some of the many types of butterflies that can be seen in DeKorte Park and environs. "The falcon eggs at 101 Hudson in Jersey City have hatched, and you can see the male and female caring for and feeding the young falcons. It's fascinating to watch." … But you have to check back a few times if things are slow. We had a full-house for our Harrier Meadow wal k last Friday morning. 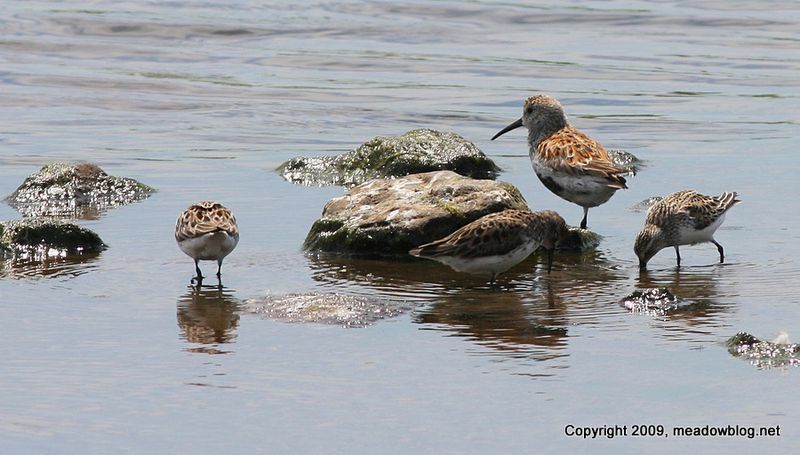 The weather was great, and so were the birds — we had 42 species, including Orchard Oriole and Dunlin (above, amid sandpipers), plus some Diamondback Terrapins sunning themselves on an old truck tire (right). For the first time on one of these walks, we did not see a raptor — until the very last minute, when one was seen perched in the distance, chowing down on something formerly animate. Click here for previous Harrier Meadow walk posts. Click "Continue reading…" for the full list, compiled by birder Ray Duffy, and shots of the group, the Orchard Oriole and an irresistible Swan "under arm." Thanks for compiling the list, Ray! This is the third of three Tuesday Teasers about unusual warblers with with geographical names. Can you ID it? 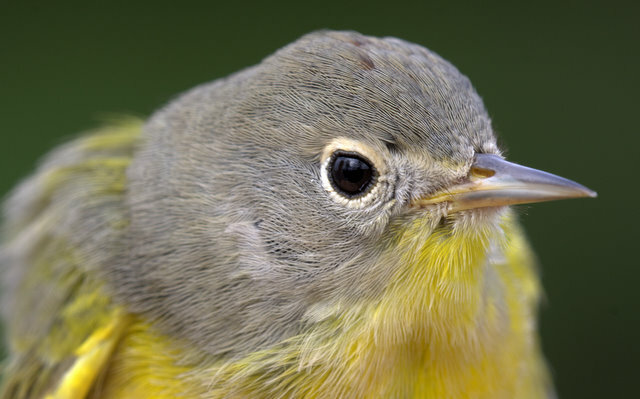 Some nifty spring migrant teasers start next week. Click "Continue reading…" for the answer to this teaser. DeKorte Park in Lyndhurst is a great place to get away without leaving home. Admission is free, and the sights this time of year are specatcular. The park, at the end of Valley Brook Aveune, is open from dawn to dusk daily. The Visitor Center and Observatory will be closed on Monday. The Osprey Nests in Kearny and Jersey City, as it turns out, are just two of more than 400 statewide. These amazing fish hawks have their own statewide blog, appropriately called the New Jersey Osprey Project. 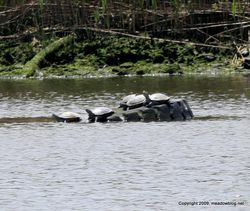 According to Ben Wurst, Habitat Program Manager for the Conserve Wildlife Foundation of NJ, "Most pairs hatch in late May, early June. You’re more likely to see them when they are around 3 weeks old." The link is to the New Jersey Osprey Project is here.